Barcelo, J.; Lídia Montero; Bullejos, M.A. ; Linares, M. P.
Dealing with traffic demand trip matrices to feed models to support decisions in traffic management is still a problem that deserves research efforts, aimed to find practical solutions applicable in the short term horizon, before future developments become available. This paper analyzes the role of OD matrices in the framework proposed for Analysis, Modeling and Simulation (AMS), namely when moving from static OD matrices to the time-sliced OD required by (AMS) applications. The paper reviews some of the time-slicing used in practice, proposes an improvement in terms of a bilevel approach, solving the lower level problem as a Dynamic User Equilibrium based on a mesoscopic approach, and shows how this off-line procedure can generate efficient initialization of recent Kalman filter approaches, that exploit measurements from Information and Communication Technologies (ICT), whose computational performance make them able for real-time applications. Barcelo, J. [et al.]. A practical proposal for the use of origin destination matrices in the analysis, modeling and simulation framework for traffic management. A: Transportation Research Board Annual Meeting. 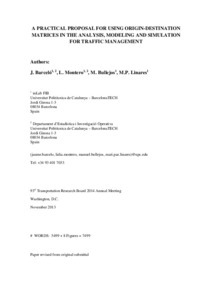 "Proceedings of the 93rd TRB Annual Meeting". Washington D.C.: 2013, p. 1-14.